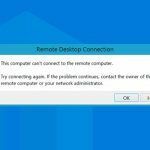 Let’s try to figure out how to fix an RDP error This computer can’t connect to the remote computer, which occurring when you are trying to connect to a remote computer or RDS server using the RDP client. If port 3389 is unavailable, you should check that Remote Connections is enabled on the remote server (Right click on Start button-> System -> Remote settings -> Allow remote connections to this computer). 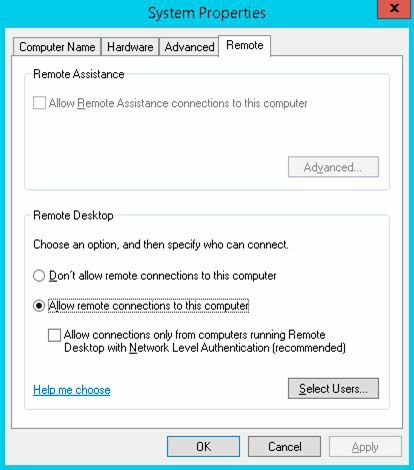 If Remote Desktop is enabled, next you should to check setting, which determines the maximum number of simultaneously connection to a Remote Desktop. Open tsadmin.msc snap-in (Administrative tools -> Remote Desktop Services -> Remote desktop Session Host Configuration). Click on RDP-TCP properties and check the value of Maximum connections property in Network Adapter tab. Another possible cause of the RDP error may be a high level of security, which is not supported by older versions of the RDP client. 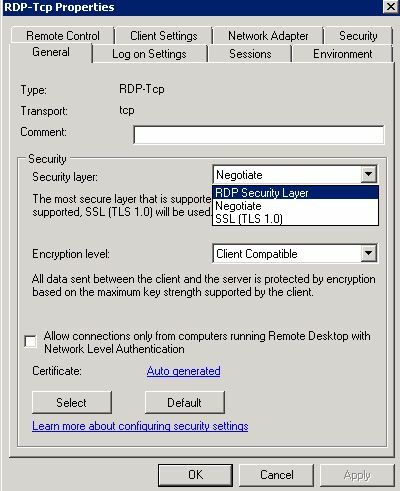 In this case on RDP-Tcp Properties dialog box open General tab and change Security layer from default Negotiate to less secure RDP Security Layer. Tip. Snap-in tsadmin.msc and RDP-Tcp Properties dialog box are missing in Windows Server 2012/2012 R2. But you can configure Remote Desktop setting using local group policy editor (gpedit.msc). The necessary policies are located in the following section: Local Computer Policy -> Computer Configuration -> Administrative Templates -> Windows Components -> Remote Desktop Services -> Remote Desktop Session Host. 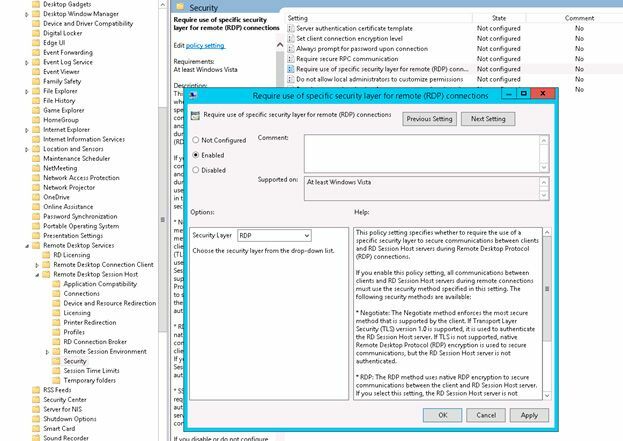 RDP security level can be specify using policy named Require user of specific security layer for remote (RDP) connections. Enable this policy and in dropdown select RDP Security level. Go back to your client PC and try to start new RDP Session. The connection should be established successfully. Thanks a lot for solution provided. it works for me very perfect. I’ve been battling this all day long! Just wanted to let you know changing the Security layer to “RDP Security Layer” did the trick. Thank you!